Preorders will begin shipping Friday, Aug. 14. Both smartphones will be available in Sprint Stores and all other sales channels beginning Friday, Aug. 21. Only Sprint offers four ways for customers to get their hands on these hot, new devices from Samsung: Sprint Lease, Sprint Easy Pay, a two-year service agreement or without an annual contract. 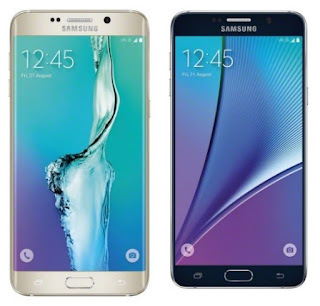 Galaxy S6 edge+ will be available from Sprint with 32GB and 64GB of memory in Black Sapphire and Gold Platinum. Sprint will offer Galaxy Note 5 in Black Sapphire and White Pearl with 32GB and 64GB memory configurations. With the Sprint Family Share Pack, families switching to Sprint get four lines, unlimited talk, text and 10GB of high-speed data to share while on the Sprint network for $100/month. This plan saves families $720 per year over AT&T and Verizon and offers more than double the high-speed data in T-Mobile’s $100 family plan (1GB per line). Through this limited time offer, when a customer switches the first four lines on the 10GB and 40GB options, they have no per-line data access charges as long as they remain on the plan. (All pricing excludes taxes and surcharges.) For families stuck with another carrier’s plan, Sprint will even pay off the phone and wireless contract when they switch. Built on Android 5.1.1, Lollipop, both Galaxy S6 edge+ and Galaxy Note 5 are powered by a Samsung Exynos 7420 Octa-Core (Quad 2.1GHz + Quad 1.5GHz) 64-bit processor. They boast a 3,000mAh battery, offering up to 28 hours of talk time. Both smartphones feature a 16-megapixel, rear-facing camera and 5-megapixel, front-facing camera that can be launched from any screen by double tapping the Home button. The rear-facing camera also includes autofocus, Burst Shot, 8x zoom, LED flash and panoramic photo capabilities. Designed with entertainment in mind, Galaxy S6 edge+ features a 5.7-inch Quad HD Super AMOLED display. The seamless dual edge acts as a shortcut from any screen to top contacts and apps. It also activates a discreet light-up notification in the edge screen when a favorite contact calls or texts. Galaxy GS6 edge+ helps share life’s can’t-miss moments as they happen with Live Broadcast. This built-in camera mode allows users to stream video through YouTube Live that can be shared in real time. Designed with productivity in mind, Galaxy Note 5 features a refined S Pen that makes it easy to write, capture notes or draw on the 5.7-inch Quad HD Super AMOLED display. Galaxy Note 5 boosts productivity through SideSync 4.0, offering seamless PC-smartphone integration across devices. This enables the user to share photos and documents with most PCs and Macs with a simple drag-and-drop operation. 0 comments on "Samsung Galaxy S6 edge+ and Samsung Galaxy Note 5 from Sprint"